The Hungarian Grand Prix was an intriguing race, with very little track action, as it's normal in the Hungaroring when the weather is stable and tyre degradation is not an issue, but with a lot happening on the pit walls and garages of the two top teams. While the way Ferrari managed the fact its leading driver was in trouble, with a steering issue preventing Sebastian Vettel from going as quickly as he could, the way everyone would expect - keeping the much faster Kimi Raikkonen behind him, as a shield against possible attacks from the two Mercedes, the Mercedes team's actions created a lot of controversy and may come back to haunt Toto Wolff by the end of the season. Unable to keep up with the Ferrari on the Super Soft tyres, Mercedes was the first top team to put its two drivers on the Soft tyre, just after they'd reached 40 per cent of the race distance. Pushing really hard on new tyres, Bottas and Hamilton were much closer to the red cars once all the pit stops were completed and it didn't take long for the young Finn to get close to his veteran countryman. Having punished his tyres hard on the first couple of laps after pitting, Bottas was never in a position to threaten Raikkonen's second place. At the same time Mercedes - in between several radio blackouts - had Hamilton insisting he could go much faster than his team mate and have a go at the Ferrari, so eventually a decision was made and Bottas was ordered to let Hamilton through. As he had done in Bahrain a few months ago, the Finn promptly complied going wide into Turn One to let his team mate go by. Having been promised he'd get the place back should Hamilton fail to pass at least one Ferrari, Bottas reasoned he could take a breather to cool his tyres and try to get back the lost grip, quickly dropping thee seconds behind his team mate. Much against his expectations, Hamilton never threatened Raikkonen and only twice was close enough to use the DRS in the first two straights of the circuit - to no avail. But Bottas struggled massively with some backmarkers and dropped nearly eight seconds behind his team mate, allowing the recovering Max Verstappen to get too close for comfort, even if the Dutch also never was close enough to be allowed to use the DRS. As Lewis Hamilton entered the last lap, he knew there was no way he could get past Raikkonen, so now the Brit and his team had a decision to make. Waiting for Bottas and allowing him back into third place was what had been agreed beforehand, but now that involved the risk of also handing a position to Verstappen, as the Red Bull was extremely close to the second Mercedes. On top of that, with Vettel on its way to victory, dropping to P4 would cost another three points for Hamilton, putting him 14 points behind his title rival, rather than just eleven points behind. Of course gaining another three points would help Bottas keep his championship hopes in better shape, but in the best case scenario the Finn would go - as he did - into the summer break 33 points behind Vettel rather than 36 points. Was this the moment Mercedes was going to make the crucial decision of putting all its eggs on Hamilton's basket and put Bottas in the same position Raikkonen has had at Ferrari since the start of the season? And was Hamilton going to comply with a order to hand back the position? If so, could he do it without also losing a position to Verstappen? 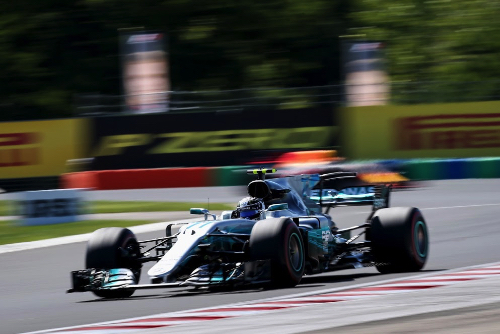 Even though the final result was not in question, the last minute and 20 seconds of the Hungarian Grand Prix were pretty exciting, for a lot of what will go on to happen in the last ten races of the season hanged on the outcome of the race. In the end Mercedes reminded Hamilton of what had been agreed and he immediately slowed down to wait for Bottas, before letting him through in the middle of the last corner, to make sure there was no room for Verstappen to following the Finn through. What went unnoticed and was even misunderstood by most watching the race on TV, was the dynamics in the Mercedes garage when all that was happening. Everyone saw Wolff punching a table and that was seen by most as a sign of anger for the final positions swap, but what happened was exactly the opposite: the Austrian was expressing his satisfaction things had happened the way he wanted, as Niki Lauda had been opposing the second reversal of places between his two drivers. As far as it is known, this is the first time the two Austrians have had an important disagreement during a Grand Prix weekend, and this one happened in front of the entire team, so it won't be easy to pretend nothing happened. But given how well Lauda and Wolff have been working for the last five years, my money is on the two Austrian being back to very good terms by the time we get to Belgium. The way I read it, what we had in the Mercedes garage was a corporate manager and a pure racer facing the same dilemma. Wolff was obviously aware of the potential consequences of making Lewis Hamilton lose three points - as he admitted at the end of the race - but explained he was prepared to shoulder those consequences. For him it was important to keep with what had been agreed over the radio with Hamilton and Bottas, to make sure Mercedes' image wouldn't suffer, to guarantee the great relationship between its two drivers wouldn't be hurt and also to guarantee Valtteri Bottas would remain motivated and faithful to the team, as his cooperation may be badly required in the final stages of this season. Lauda, being a former driver - and a pretty good one at that - saw it differently: in his mind Mercedes' best chance of winning the Drivers' Championship is with Hamilton and the English driver should grab as many points as possible in Hungary. Yes, that would upset Bottas and change the atmosphere inside the team but the three-times World Champion probably reckoned Wolff and himself could deal with that later, making sure the situation didn't escalate like in the Rosberg-Hamilton days. Basically, Toto Wolff saw the issue from a corporate point of view and did what he believed was the best for the company's interests, while Lauda, a pure racer, saw it entirely from a competitive point of view, with the cut-throat mentality that made him one of the best Formula One drivers ever. Personally I would have been OK with any of the decisions because I feel they were both more right than wrong: keeping what was agreed was the honourable thing to do, would keep the team harmony and help Mercedes' image; breaking the promise made to Bottas, though, would help Hamilton's title chances, minimising the losses to Vettel over the weekend, even if they would make Bottas' own chances even slimmer than they are now. In the end corporate sense prevailed rather than ruthless competitiveness and Mercedes can only hope this decision will do them more good than harm in the next five months.